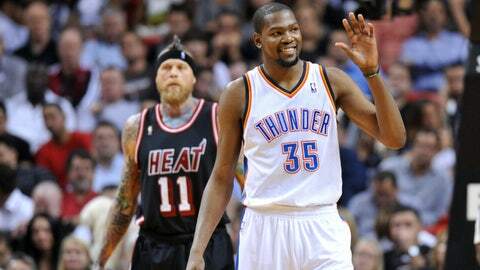 Kevin Durant’s largest endorser clearly wants him in Washington D.C.
Will Durant leave OKC for the nation's capital? For sale right now on Nike's website is a t-shirt with Kevin Durant's signature logo that strongly suggests the Oklahoma City Thunder forward either does or should play for the Washington Wizards. It's all black with a picture of the Washington monument and Capitol Building across the chest. Nike's website describes the product as having “subtle graphics,” when, actually, this is the least subtle t-shirt in existence. Durant is a free agent this summer, and a ton can happen between now and then. If the Thunder win the championship there's almost no chance he leaves. But if they struggle and can't even get out of the Western Conference, there's a very strong chance Durant takes his immense talent elsewhere. And the Wizards, the star's hometown team, are as likely a franchise as any to pry him away.